My friend and fellow author Rachael Mollison-Read wrote a blog on May 12th that I just got around to reading today (Granny’s slow, but she’s old). I had told myself repeatedly to take a few minutes and read it because it was about a favorite subject of mine: daydreams. Unfortunately, my life at present is hectic and stressed. I’ve not had much time time for daydreams, much less for reading blogs posted by my favorite fellow writers. It takes just a few days for a message in my inbox to be deeply buried in the daily avalanche of messages. Fortunately, I had marked it as important, and it avoided the deleting trashcan my janitorial husband uses to clean up my inbox. Anyway, this is the third time Rachael has posted a blog that inspired me to create. So please, take the time to visit her blog and share a moment of daydreaming. I daydream especially when I work simple chores (dishwashing, sweeping, gardening, etc.). But I also love to sit at my desk and look out my window and down a forest path. Dreams, dreams, dreams come easy through a “looking glass” that provides a nice view. It does not have to be a spacious spectacular view; a simple backyard garden can provide enough dreams and inspiration to create a story of magic. Imagine fairies tending your flowers or dancing around a birdbath with the moon reflected in the water. I’ll wager if you stared into the underwater world of an aquarium long enough, it could provide the daydream and inspiration to write a story like Finding Nemo. Sometimes, my daydreaming from my window is interrupted by Nature. A bird will land on an oak branch and sing to me or a rabbit will hop down the path and stop and check his watch. 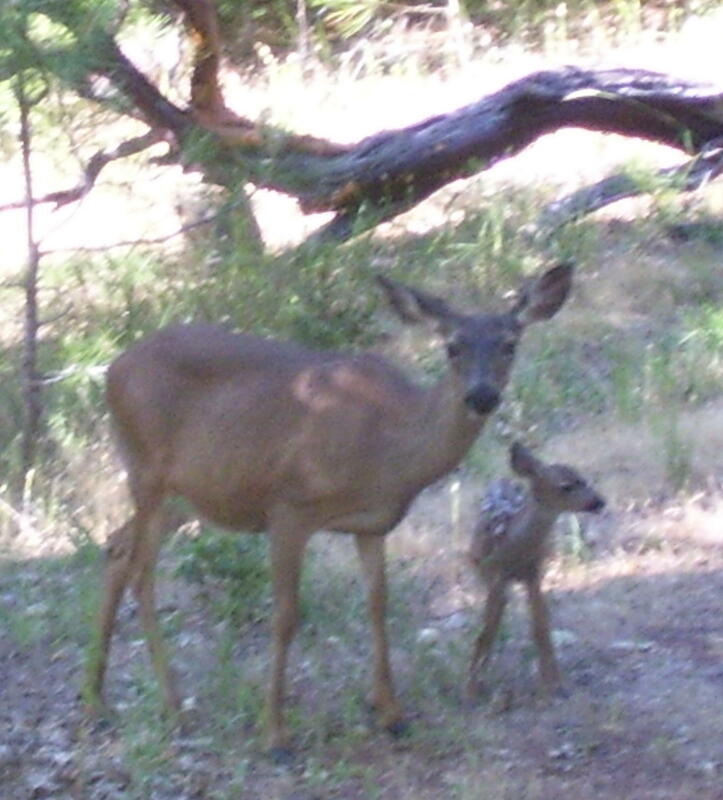 🙂 Last year a mama doe and newborn fawn came to visit and interrupted my daydream, but I didn’t mind. I grabbed my camera and clicked a picture through the semi-clean windowpane. 😦 So please forgive the hazy image. Awaits her fawn who moves so slow. Then scamper up a grassy hill. The fuzzy tops of blooming clover. All leap and dance on nature’s lawn. Not now, but on another day. When stronger then his legs will be. For him with his ungainly gait. They doused the raging blight. So please, dear reader, don’t let the daily drudgery rob you of magic. Take time everyday to daydream, and just maybe, one will become reality. Every story and poem is a daydream come true.